President Trump emphasized his commitment to domestic manufacturing and robust military strength on Friday, repeating his "buy American, hire American" mantra to a crowd at the Boeing planet in Charleston, South Carolina. "We love America and we are going to protect America," Trump said in his remarks at the unveiling of Boeing's 787-10 Dreamliner plane. "We love our workers and we are going to protect our workers." Boeing CEO Dennis Muilenburg made introductory remarks, describing the company's new plane as one that will "change the world" for its customers. Hitting on Boeing's commitment to American manufacturing, Muilenburg described the Charleston locale where the plant now resides as a former "swampland." But, after $2 billion in investment, Charleston now houses Boeing's modern airspace facility. "Mr. President, our commitment to you and to our country is to continue to build dreams, grow and sustain jobs here in the U.S., bring new innovation to our customers that allows them to connect, protect, explore and inspire the world," Muilenburg said. Trump took the South Carolina stage, saying of the Palmetto State that his campaign "won in a landslide" there. He also joked that before assuming the role of president, he used to "make a lot of money" for giving these kinds of speeches. "What an amazing piece of art," Trump said of the new Boeing creation, which he noted as being made of carbon fiber and carrying 330 passengers. "We want products made in America," said Trump. "American industry is roaring back." Trump then pivoted to addressing military strength, though, calling out any members of the armed services who may have been present at the event. "South Carolina has a long, very proud military tradition," said Trump. "We are going to rebuild our military." 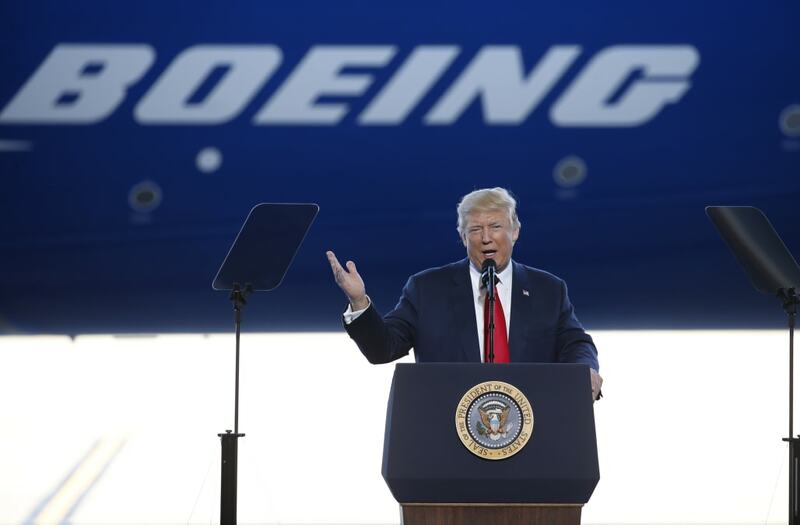 Back in December, Trump urged the government to cancel an order with Boeing for a revamped Air Force One -- saying costs were out of control. He later announced that Boeing would be included in a White House "Manufacturing Jobs Initiative," as part of his overall jobs creation agenda. He alluded to continuing talks with Boeing around an Air Force one contract, saying "Dennis [Muilenburg] is a very tough negotiator." He also referenced Boeing's F/A-18 Super Hornet jets -- an innovation the Pentagon has been discussing as a new option for aerial forces. On military strength, Trump quoted founding father George Washington, saying "Being prepared for war is the best way to prevent it." The president's remarks connote that Trump's agenda in increasing the American military arsenal and empowering the domestic job force are one in the same. Trump was certain that American is geared for increased military power, saying, "The U.S. will build a military mite so great, none will dare to challenge it."